Description: The project will demonstrate a simple Haloed Lined Wireframe with option of toggle and color filling. A Pyramidal octagonal shaped is made along with a torus tube. 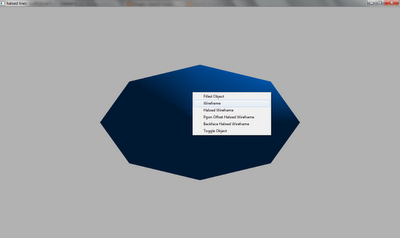 The use is allow to toggle between the shapes as well as from the 3D filled object to haloed object. Filled Object : Fills the wired object with color. Wireframe: To see wireframe view. Haloed Wireframe: Halo the object wireframe. Pgon Offset Haloed Wireframe: Offset the halo. Backface Haloed Wireframe: Back face the haloed wireframe. Toggle Object: Toggle between the two objects.